[AUTO](VC)[1/Turn]:[Counter Blast (1)] When this unit is placed on (VC), or when your G unit Stride, you may pay the cost. If you do, choose a column, and your opponent cannot call cards to the (RC) in that column during the next turn. [AUTO](VC) Generation Break 1:[Soul Blast (1)] At the beginning of your ride phase, you may pay the cost. If you do, your opponent chooses a face up card from his or her damage zone, turns it face down, and you Counter Charge (1). Okay, technically not the same Darkface, but has the name so I guess it counts for all intents and purposes. The Stride skill’s a mini Obtirandus, but usually one would want to pair her WITH Obtirandus so it’s a bit underwhelming, but if that’s not the route you want to take, it doesn’t hurt any. It’s the GB1 you really want, taking resources away while countercharging your own. Something worth mentioning is that Mutant Darkface and Darkface Gredora don’t really gel in the same deck together, despite the name. They have playstyles that are too different. Gredora’s in it for the long haul and only comes into her own Late Game. She has to rely exclusively on rear-guards to stun like Darkface Alcides, and because she cannot stun, her offensive options such as Merciless Darkface are right out. Obtirandus and Overwhelm abuse are the only real routes she can take, stalling the opponent out. Not that it’s BAD. On the contrary, Overwhelm can hit big numbers, giving her the offensive push she needs, and between Twilight Madder, Dangerous Horn and Bolg Wasp making at least 15k guard without it you won’t be starving for numbers. Still an option to annoy opponents with and a great way to bait people into throwing guard away to preserve a front-row unit. Unless the opponent powers up their Grade 1 and beats face anyway. What’s up, Rogue Squad?! So, not many of you know this, but I love Megacolony, and not just because they’re the worst possible matchup for my least favorite clan, Aqua Force; but also because I love the lore of them being the mafia of Cray, meaning that they are considered overall gangsters, and who doesn’t love gangsters? But every gang and family has to answer to their respective higher power, a leader or godfather if you will, and the bugs only answer to the name of Darkface, and the queen of them is our card today: Gredora. Gredora is a very interesting queen as she 1.) doesn’t stun Units like almost every other Megacolony unit out there and 2.) 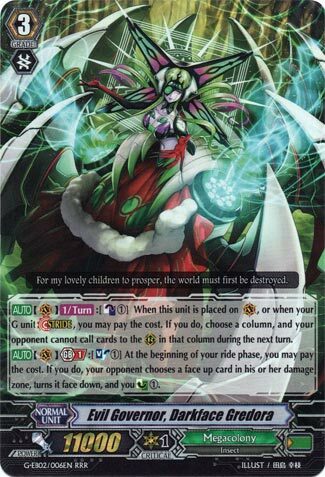 She affects the opponent in two different and unique ways: call prevention and damage absorption. For call prevention, she’s pretty much a cheaper Obtirandus in both cost and effect as she only hits a single column unlike the now super expensive GR that hits the whole opposing field but with one less Counterblast and no discarding. However, her effect pretty much becomes essentially free when you combine it with her second effect: if you Soulblast 1, in short, you steal a faceup Damage from your opponent. This is crippling to a lot of decks that rely on their costs coming from their own Counterblasts and will make them unable to use certain combos in a future turn. Yes, the drawback is a Soulblast, but to be fair, that’s not that cheap for Gredora as the deck itself has a good number of ways to keep a solid Soul count. Personally, I’m willing to bow to this new queen.